I have always been a Taylor Swift fan, from the days of Our Song to Love Story to Enchanted to Starlight, I've listened to her music through it all. Many people who I've spoken to have expressed dissatisfaction with Miss. 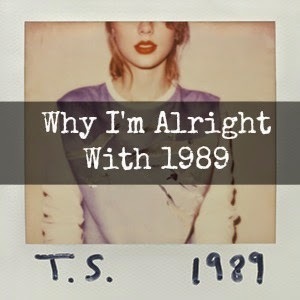 Swift's newest album, 1989, because it deviates quite far from her original sound. But if we look back, it is clear to see that each successive album has lead Taylor to this point of being a pop singer. I've found that not being married to a particular sound from her has allowed me to enjoy it all! The album has a variety of songs that are all enjoyable to listen to (and dance around your room to). My favorite is Wonderland because the references to Alice's Adventures in Wonderland are just enough to help the story of the song along without going overboard. I also find New Romantics to be a fun song along with Blank Spaces. Overall, I actually prefer her new aesthetic! What are your feelings on the new sound?